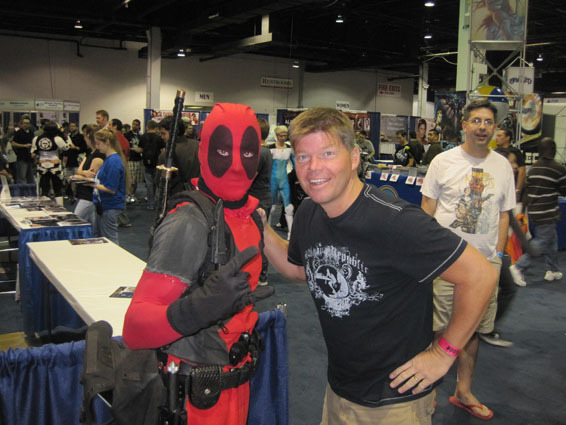 Two years ago, I was attending San Diego comic con 2008, seated at my table sketching Deadpool drawings for rabid fans when a group of fans breathlessly stormed my table. A pair of guys and a girl rushed up to me, one of them slammed their hands on the table, literally shaking the entire desk. ” They showed footage of DEADPOOL!” One fan said, “He’s awesome! He’s got the swords, he’s slicing guys left and right!” They were so excited to share the footage that they had seen at the Fox movie panel. “Ryan Reynolds is AWESOME!” They exclaimed. 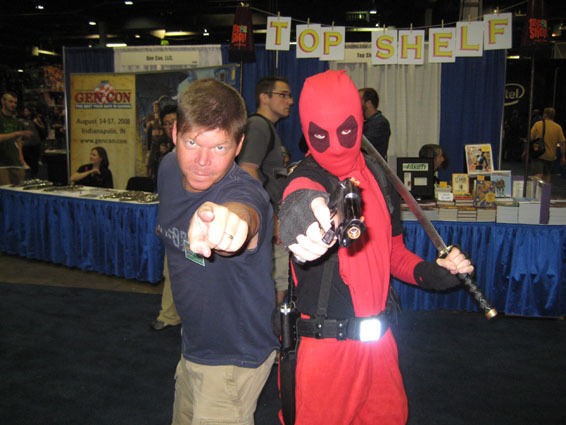 For years now, I have had a long, well documented relationship with Deadpool. From the moment I wrote him and illustrated him in the pages of New Mutants #98, he became bigger than life and overnight the fans had a powerful connection with him. They were passionate about all things Deadpool. Over 20 years, Deadpool has seen his share of ups and down’s as many different creators have taken a pass on him and added to his growing legend. 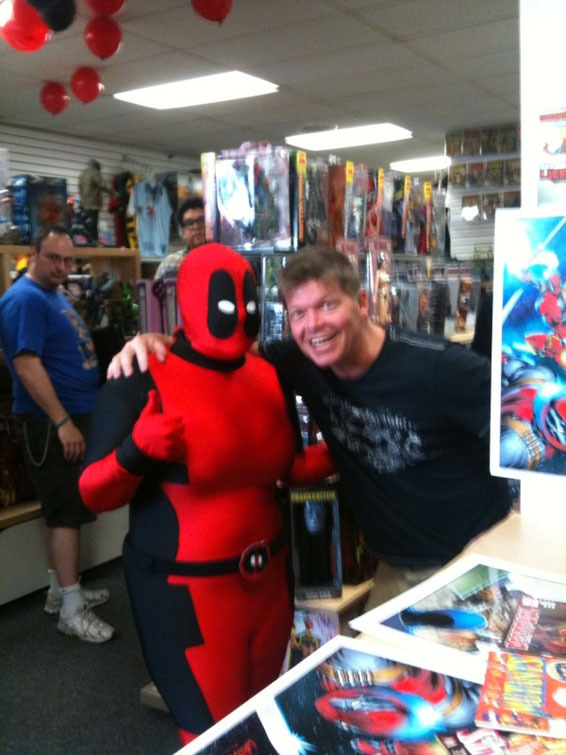 Currently he’s in at least 7 comic books at Marvel, Deadpool, Deadpool Corps. 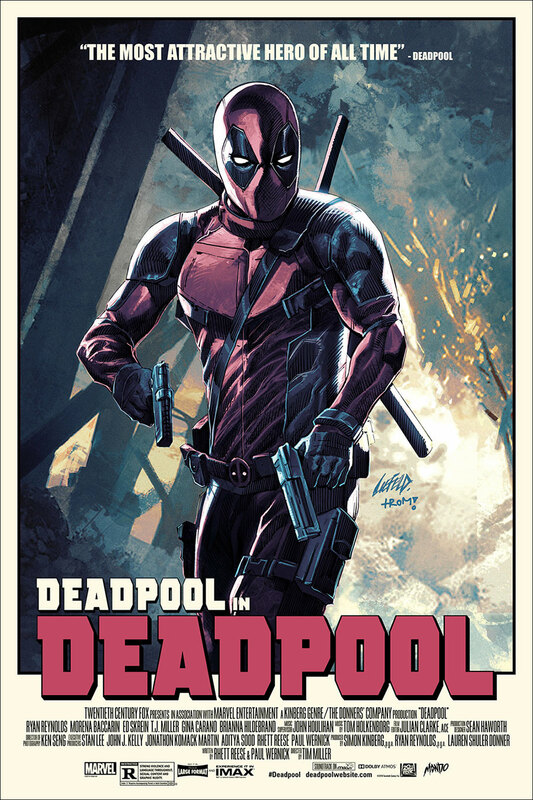 Deadpool Merc with a Mouth, Deadpool:Wade Wilson’s War, Deadpool Pulp, Deadpool Noir, Doomwar, and Uncanny X-Force. He ranks up with Wolverine and Spider Man as Marvel’s most traveled character. He is so popular that just last week I received a letter from someone claiming to be a real life serial killer insisting that he would be the perfect person to portray Deadpool on the silver screen. Seriously. 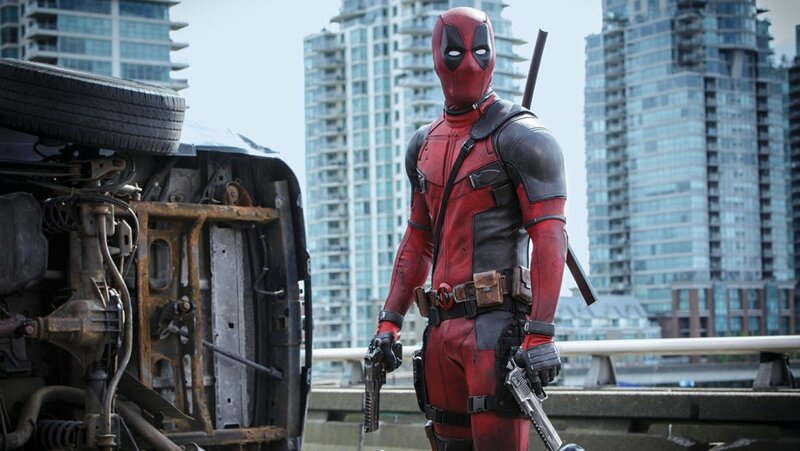 Over the past two years, Deadpool’s popularity has exploded, cosplayers have emerged in record numbers on the convention circuit, his early appearances have skyrocketed in price and in my humble opinion it is a direct result of his appearance and portrayal by Ryan Reynolds in X-Men Origins: Wolverine. His brief part and subsequent pop culture impact was akin to Boba Fett’s barely there star turn from his cameo roles in Empire Strikes Back and Return of the Jedi. Maximum impact from very limited screen time, a potent cocktail if you can catch that particular lightning in a bottle. It was no secret to me that the reason Deadpool resonated was because of the actor picked to play him. Ryan Reynolds star was rising for some time and with last summer’s double impact of Deadpool in Wolverine and The Proposal with Sandra Bullock, he cemented his role as new A-list leading man. The day after Wolverine’s $85 million dollar opening, FOX greenlit a Deadpool film with Reynolds taking the spotlight for an entire film. The Deadpool film promised to course correct aspects of the character that were not in line with what fans expected in Wolverine. But again, the fans had given Ryan Reynolds their stamp of approval. 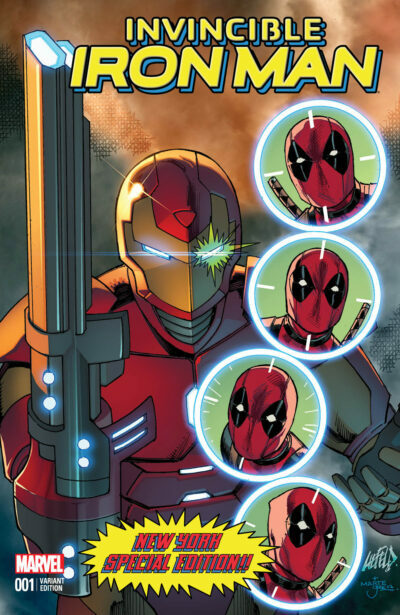 He had given Deadpool a face, he was the guy they had been waiting for! I was a longtime fan of Reynolds work, from Three Guys and a Pizza Place, to Van Wilder, Blade, Smoking Aces, I loved it all. So when he was cast as Deadpool, I was beyond thrilled. The Deadpool movie got yet another shot in the arm when The Donner Company that produces the X-Films, along with Fox hired the screenwriters of one of my favorite films, Zombieland, to pen the Deadpool movie! WOW – is this a dream come true or what? I was like, someone pinch me!! A-list Superstar, Brilliant screenwriters, great studio and producers….what’s not to love? 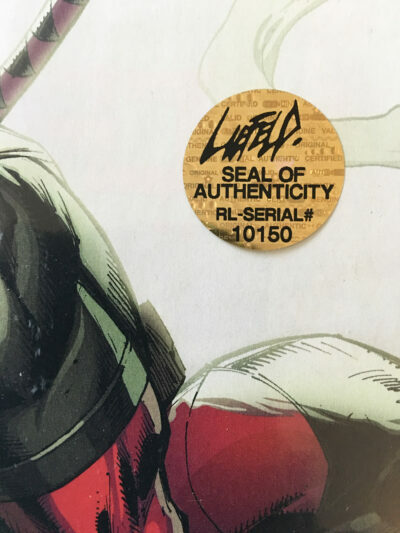 Well the ink hadn’t dried on the Deadpool announcement and Warner Bros. cast Ryan Reynolds as Green Lantern, DC’s most popular character the past few years. Made sense, Reynolds stock could not have been higher. I’ve said for years he’s the next Will Smith. Everyone likes him, guys want to hang with him and women LOVE him. He’s bonafide A-list leading man, young and ready to fill the role Smith and others have vacated. Hey, Harrison Ford has been Han Solo, Indiana Jones, Decker and and Jack Ryan, it’s not like the public doesn’t accept actors in multiple roles. Ditto Stallone as Rocky, Rambo, Cobra and the Cliffhanger guy. While filming Green Lantern, Reynolds stock grew even greater, as he is literally up for every single leading man available. His agents and managers must be on cloud nine, living the dream. The dude is an absolute lock. While Fox seeks out a director for Deadpool, Warner Bros. announced their intention to film Green Lantern 2 and 3, potentially back to back. At some point something has to give right. 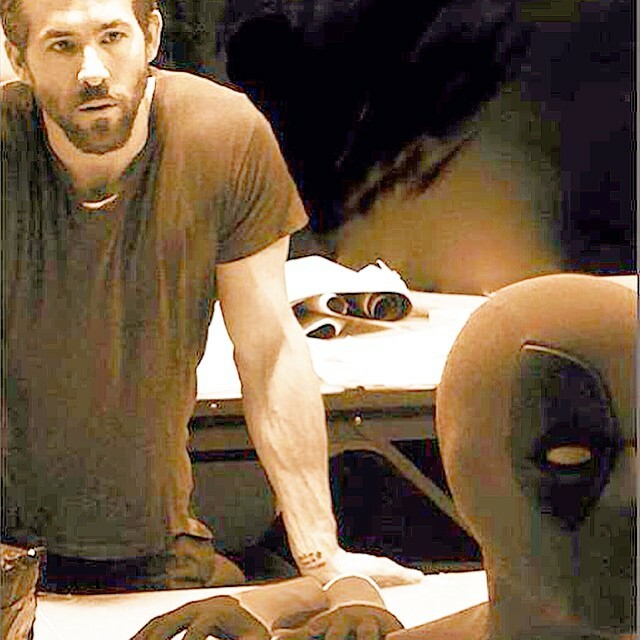 Ryan Reynolds needs to sleep and eat and breathe, he can’t work non-stop 24-7. When the heck is Deadpool going to happen? So while I’m quietly stressing about this dream package coming together, I start reading article after article with other less invested parties speculating the exact same sentiments. Google Deadpool movie and you will get 50 articles responding to Warners. intent to make back to back GL films. Green Lantern vs. Deadpool is real. Aye Carumba. And here’s the thing, I totally get it, if I’m Warners. I’m offering every incentive possible to keep Reynolds away from another super hero franchise that would compete with my $200 million dollar investment. By greenlighting two more Lantern films, 9 months before Green Lantern officially launches they are projecting confidence and excitement in their investment. I’ve got a big mouth to begin with and I’ve used it as a vocal cheerleader throughout the entire process. What felt like a million fans over the last year asked me how I felt about Deadpool’s role in the Wolverine film?? I told everyone that Deadpool was off to a good start in the Wolverine film, and I assured them that the best is yet to come. I had nothing to do with is appearance in Wolverine, but fans wanted to hold me accountable as if I had consulted in some way. At this juncture, with the combination of writers and stars involved, I remain confident. But the window for a Deadpool film won’t stay open forever, nothing ever does. The irony in Reynolds playing both GL and DP is that each character is simultaneously experiencing untold popularity in the comic book realm. 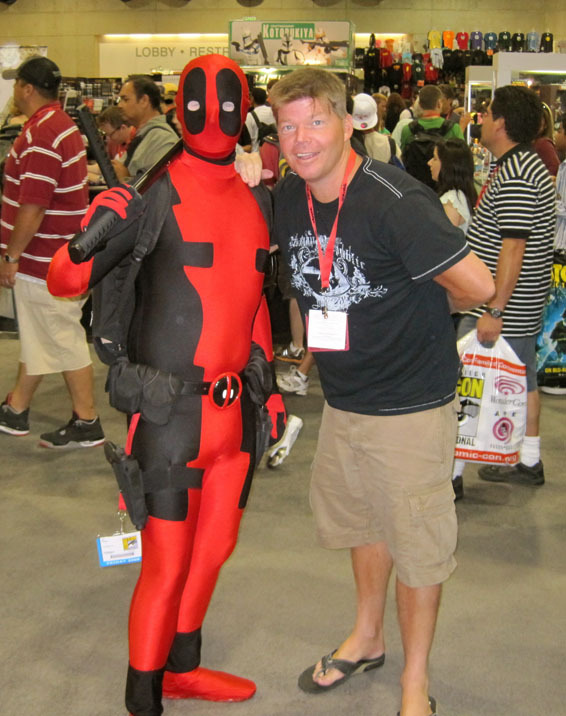 Deadpool costumes and Green Lantern rings are all over every convention and I attended a dozen of them this past year. Deadpool and Green Lantern merchandise, t-shirts are the top sellers, and neither has a full length film released as yet. So the gauntlet has been thrown and in typical fashion I gripe, complain, and praise on line, via twitter, facebook and other social network’s. I want a Deadpool film and I want it soon! If I read the calendar and tea leaves correctly, there are openings in the spring. If Fox is approaching directors, then they intend to shoot a film and presumably sooner than later. I hope Green Lantern is spectacular, not for any other reason than I’m a fan, I love GL and I would love a new comic book franchise to enjoy. 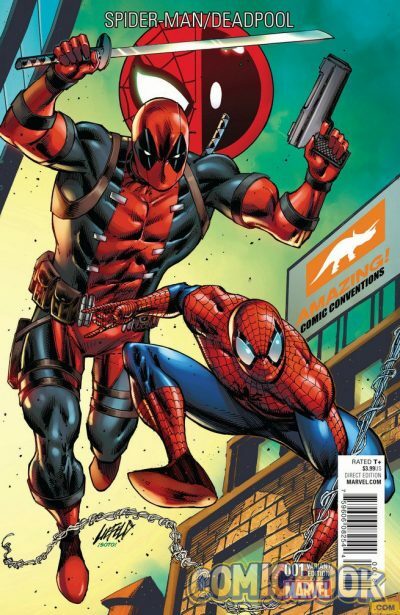 GL is a space cop, Deadpool is super powered, lunatic mercenary, no one will mistake one for the other. The two could not be more polar opposite and as such will co-exist brilliantly. The biggest difference for me is that Deadpool’s my baby, and I want to see his movie more than anything else. He is my best known creation and he’s family, his time is now! So hopefully it all comes together, because if not, I might become a real life mercenary myself, on the prowl for movie execs in Southern California.